"It felt like my heart was going to come out of my body," Yolany Padilla said of being reunited with her 6-year-old son. 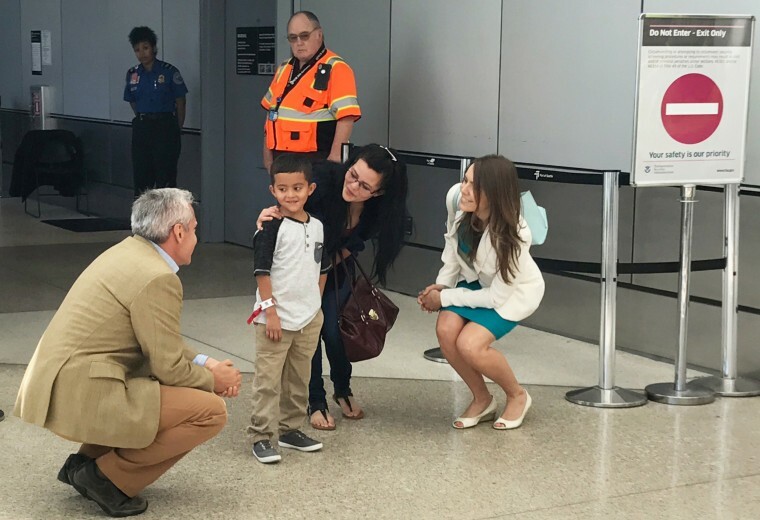 As 6-year-old Jelsin Padilla exited gate A2 at the the Seattle–Tacoma International Airport, he nervously glanced around the terminal. Since May, Jelsin had been shepherded by strangers from Texas to New York, New York to Washington state, and now he only hoped to see one familiar face. While he scanned a row of seats to his left, his mother, Yolany Padilla, 24, from whom he had been separated while crossing into the United States nearly two months previously, was bounding toward him. Before he even realized she was there, Jelsin was being scooped into his mother's arms and lifted off the ground. Smiles spread across both their faces. "It felt like my heart was going to come out of my body," Padilla told NBC News affiliate King5 through tears. On Saturday, Padilla and Jelsin, who fled to the United States from Honduras, became one fewer family awaiting reunification after being separated at the border under the Trump administration's "zero tolerance" policy. The U.S. government is working to reunify more than 2,500 minors between the ages of 5 and 17, who were separated from their parents while illegally crossing into the United States. Officials must do so by the July 26 deadline set by U.S. District Judge Dana Sabraw of the Southern District of California, which is overseeing the reunification process. So far, the Trump administration has reunited 57 of the 103 children under age 5 who were separated at the U.S.-Mexico border under the "zero tolerance" policy, missing the July 11 deadline set by the court. In June, Trump signed an executive order ending his administration's policy of separating parents and children at the border. Initially, the president claimed that only Congress could pass a law ending the separation policy, but amid mounting pressure from his own party members, Trump reversed course by signing the order. However, the order did not change the “zero tolerance” policy of charging people with a misdemeanor for entering the country illegally. In a statement released on Friday, U.S. Department of Health and Human Services spokeswoman Evelyn Stauffer said that the number of children awaiting reunification could include "a significant number of minors who cannot or should not be reunified with the adults in question." "The number is not the number of minors who will eventually qualify for reunification and be reunified," Stauffer said. "It is not, nor should it be, our objective to reunify all 2,551 minors with the adult whom they arrived here with, because some of those adults are not their parents or pose a clear danger to the children." Some children under 5 have not been reunited because the adults claiming to be their parents either did not pass a DNA test or have criminal records. According to HHS, among 11 parents found to have a serious criminal history, some had charges or convictions of child cruelty, kidnapping and murder. However, some had lesser charges, such as driving under the influence. HHS officials declined to give more information on how criminal backgrounds could prevent reunification. But on July 10, Judge Sabraw ordered the government to streamline some vetting procedures for reunifying parents and children. Padilla was released four days before that order from the Northwest Detention Center in Tacoma, Washington, where she had been held since turning herself into Border Patrol in May on an $8,000 bond, King5 reported. Upon her release, Padilla assumed she would be quickly reunited with Jelsin, but because of the vetting process for reunification — including fingerprint collection and analysis that could take up to 60 days — she was told it could be weeks before she saw her son. After Sabraw's order, Padilla's lawyer was told her client's case was among those referred for expedited processing. Jorge Barón, executive director of the Northwest Immigrant Rights Project, who helped Padilla be released on bond from of the detention center, said that four other asylum-seeking parents had been released on bond, according to King5. Still, he said, the reunification process will be slow going as the courts work through the backlog of cases of separated families. “Even though there’s a sense that family separation, this policy, has ended, it hasn’t ended,” he said. "What we're demanding is that we see moments like these happen right away, where families have been reunified." One day before Padilla and her son were reunited, seven immigrant children being held at the Cayuga Center in New York, where Jelsin had been held prior to flying into Washington, were reunited with their parents, according to NBC New York. Yeni Gonzalez, a mother from Guatemala, was reunited with her three sons, ages 6, 9 and 11, with the help of her attorney and volunteers who paid her bond through crowdfunding. They also drove her from the Eloy Detention Center in Arizona to New York. She had a message for other parents still in detention. "Fight," Gonzalez said. "Because with the help of all these people, you will succeed, and the help of God."